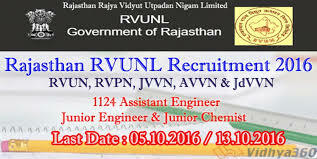 Rajasthan State Power Sector 1124 POST - . Eligible and interested candidates may apply before the last date. Application must be submitted in the prescribed format only. Before applying for the post, candidates should ensure that he/ she fulfills the eligibility criteria and other conditions mentioned in this advertisement.